MagicShine is proundly to bring a multitude of new lights onto the market.The MJ-906 uses a TIR optic lens to produce a wide flood beam that lights up your entire field of view. The included tail light provides positive visibility from the rear, day or night. The tail light is powered by the same battery as the headlight using the included Y cable splitter. It is also controlled by the wireless remote. The new streamlined battery pack straps on with two velcro straps and has a rubber pad to protect your frame and hold it tight. The connector is common with most other batteries. The new stainless steel mounting bracket is bullet proof and uses MagicShine's new custom molded straps or the standard O-ring to mount it up. MAGICSHINE MOUNTAIN BIKE FRONT LIGHT ★ The Magicshine MJ-906 LED bike front light offers 5000 lumens of maximum output.Perfect for Mountain bike as front headlight. 5xXM-L2 LEDs are housed with high quality plastic and aluminum alloy for best weatherproofing and heat dissipation. OUR MTB LIGHTS FEATURE 5 DIFFERENT INTENSITY MODES PLUS FLASH MODE ★ Beam pattern for the MJ-906 LED light for bike is 20 degree, designed for off road, MTB and trail riding. 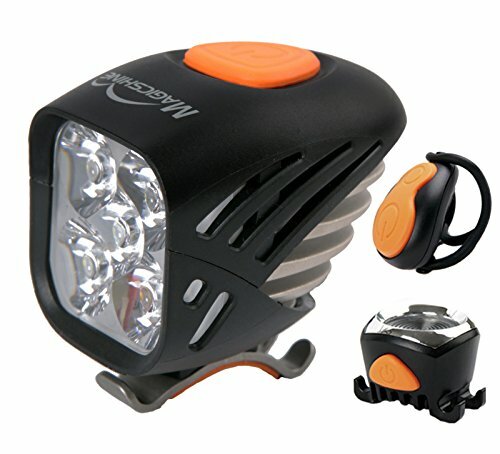 Rechargeable bike light features 5 power modes as well as a flashing mode feature, giving you the versatility to choose the most efficient lighting for the ride conditions. HIGH QUALITY BATTERY PACK ★ 6 x 18650 Li-ion battery (7.4V 7.8Ah) using velcro straps to attach to your frame. Shape of the casing has been beautifully molded to hug the bike bars to be more aerodynamic. All Magicshine batteries include a circuit with over-charge, over-discharge and short circuit protection meaning you can be sure that your Magicshine battery is safe to use and charge. FREE BICYCLE TAIL LIGHT AND REMOTE CONTROL ★ The MJ-906 is designed for mountain biking and off road riding but a tail light will allow you be seen on roads and urban streets. Wireless remote control can be strapped onto the bike handlebar and switching between working modes will be ultra convenient especially if you decide to mount the 906 on your bike helmet. ★★ When not in use, the remote causes the light to continuously draw small amounts of power from the battery pack, this process will drain a fully charged battery in 1-2 weeks. Therefore we recommend disconnecting the light from its battery after each ride.